Bosco Organization for Social Concern and Operation (BOSCO) Delhi- is part of the Don Bosco international organization dedicated full time to the service of the poor and disadvantaged. The society is founded by St. John Bosco, an Italian saint-educator who has left posterity in his unique way of educating the disadvantaged with opportunities for livelihood skills. Today the society works for the development and education of the young especially, those most at risk. Through its 3000 schools, colleges, technical schools and youth centers in 132 countries, the Don Bosco Society serves humanity with offering opportunities to the marginalized and vulnerable, irrespective of religious differences or social inequalities. BOSCO is registered under the Societies Regulation Act 1860, (reg. No. S/41069). It has the approval u/s 80G(5) (vi) of the Income tax-Act 1961. It has PAN & TAN Numbers under the respective income tax law. It has its National Office situated in the Jamia Nagar- Okhla area of New Delhi, India. Through various interventions, BOSCO reaches out to the poor, needy, handicapped, young at risk, street children, child laborers, refugees, backward classes/tribes, marginalized and under privileged youth and women, irrespective of any caste, creed, ethnicity, or religion, in order to facilitate and assist them in their own development. Its areas of intervention are human development through training and capacity building; access to basic education for all children; skill training and placement for youth and school drop outs; empowerment of women through skill training, formation of SHGs (Self Help Groups ) and community development programmes; housing for economically vulnerable and socially excluded; scholarship and sponsorship for school going children and poor youth for non formal vocational training; adult literacy and community development activities; self-employment programs at community level; street children’s work (YAR); refugee assistance project in collaboration with UNHCR; de-addiction programme for street children; education and health care among brick kiln child laborers; net working with other NGOs, Governments, industries and corporate sectors. 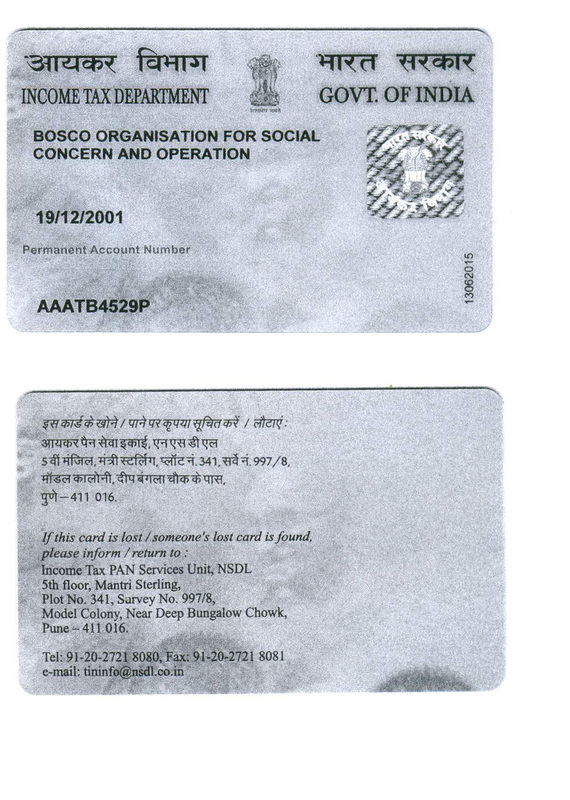 Bosco Organization for Social Concern and Operation: a charitable society was registered under the Societies’ Registration Act 1860, on 19th December 2001. In the initial years, the activities were limited to supporting the existing centers with project formulation and implementation of the vocational skill training projects. The children’s sponsorship program was facilitated and monitored through the office. Apart from the projects, various training programs were organized for the local partners in youth survey need analysis. Bosco continued to function as a nodal agency for support and training. Together with the Don Bosco Ashalayam, the training for refugees was introduced with the support of United Nations High Commission for Refugees (UNHCR). Apart from the projects taken up in the previous years, social development activities were launched in many other centers. Tuition classes commenced in various centers to cater to the school going children who were weak in studies and who had no one at home to guide them in their studies. As we moved forward, a large amount of families were privileged to have a roof over their head, as a housing program was launched to build houses for the economically weaker sections of the community. Young women received possibilities for skill training through the outreach tailoring centers. Social integration was promoted through various activities for children and women through tuition centers, recreational facilities and formation of SHGs. We received the mandate to network and to coordinate with all the Don Bosco Vocational/ Technical training centers across India to strengthen and to facilitate the skill training. National level training programs were launched for the staff to improve the quality of management and training. The newly developed Modular Employable Skills were made available for replication. Training and capacity building of staff on curricula, life skills, class room management and monitoring were initiated to improve the quality of the staff and the training programs. With the support of “Youth Reach”, various other components in training; life skills, entrepreneurial skills, counseling etc. were introduced to the staff and the trainees, to improve their capacity. The eagerness of the various funding partners to collaborate with Bosco shows their belief in the organization and its relevance. As Bosco enters its 17th year, it is our firm belief that it will always be at the forefront of Social transformation through its mission, “Build capacities of the marginalized and make them agents of change”. Comprehensive development programme for Refugee and migrants.